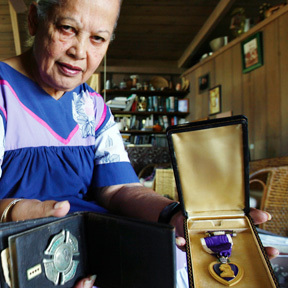 HAWAII NEWS » Leilani Edith Gilman Kekoolani displays the Purple Heart given to her father, civilian firefighter John Alawa Gilman, after the attack on Pearl Harbor. After the Waipahu native Brian Viloria knocked out Eric Ortiz, he won more than just the championship belt. Thousands take part in the Shinto rites of cleansing and blessing. The Rainbow Warriors defeat Northwestern State without Julian Sensley and Bobby Nash. About 2,900 guests qualify to share the $1.8 million settlement. Congress has extended the Patriot Act for five weeks, refusing permanent authorization.